Last week, my husband sent me a link to this article. I’ll give you a minute to read it. Ok, well he suggested that we go whale watching on Labor Day, as it was our only day off together the whole weekend. Surprisingly, I was the one working. Wait, aren’t I a teacher? And aren’t I on summer vacation? Yes and yes, but I also had a wedding to coordinate. It deserves a post on it’s own, but I’ll get to that another day. 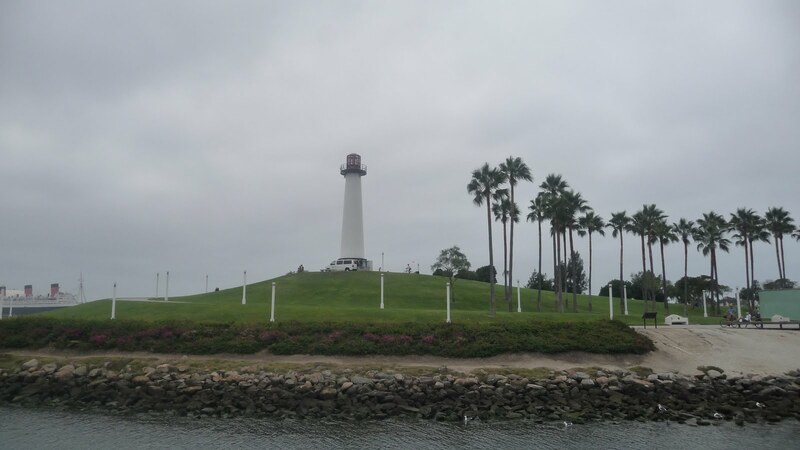 I was SO excited that we were going whale watching as I had never been. 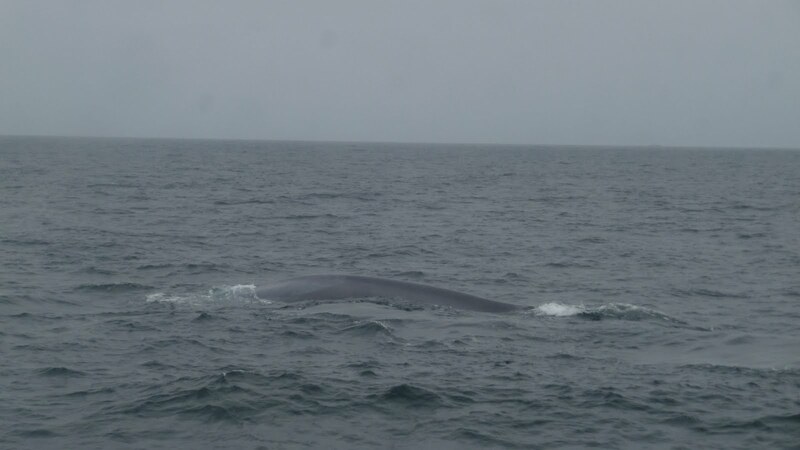 It was also extra exciting because we had a pretty good chance of actually seeing the largest animal on the planet: blue whales! Here we are on the boat about to set out to sea! 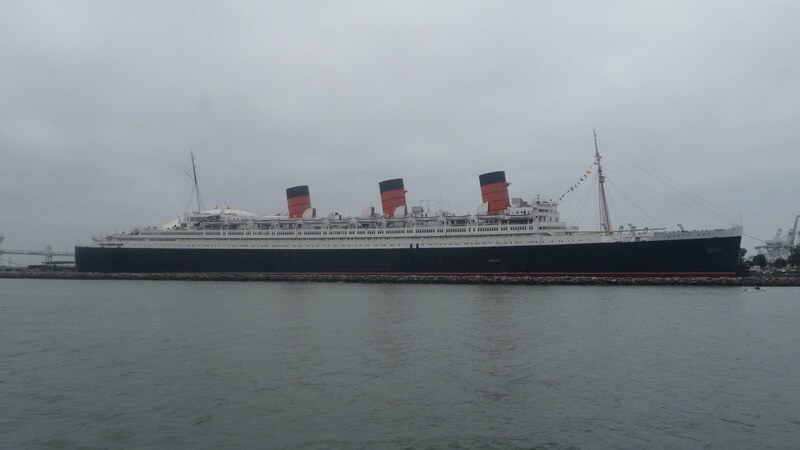 and the famous Queen Mary! 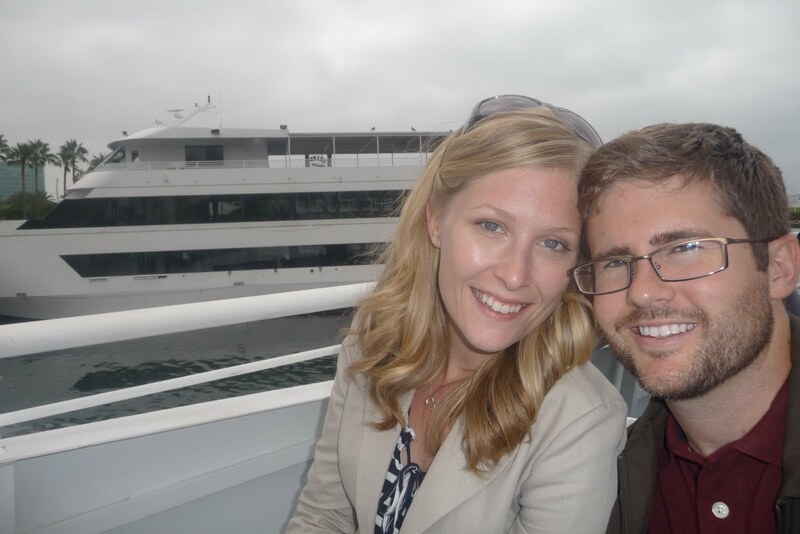 Here’s the thing about me and boats: my husband always thinks I get seasick, but I’ve never once thrown up on a boat. I do kind of freak out on the ocean (as opposed to a calm lake), but really I’m just scared that we are going to topple over or that the boat is going to fall to pieces. For the first 20 or so minutes of the 3 hour boat ride, I had visions of flying overboard and being rescued by a helicopter. 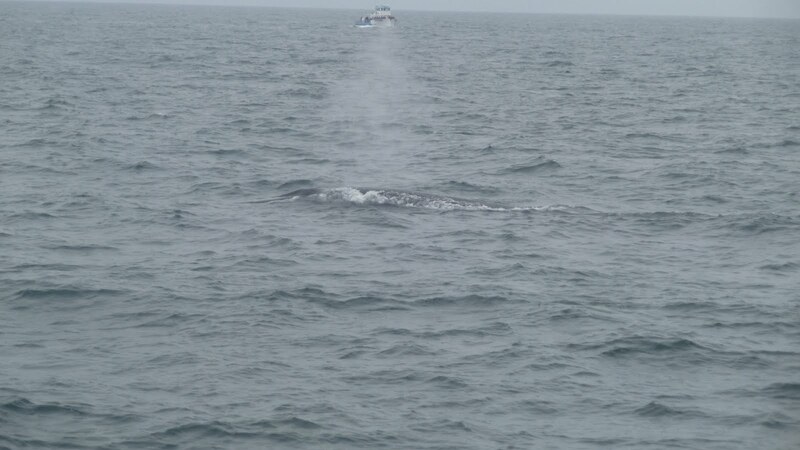 Once we saw the first whale, though, my fears subsided and I was able to enjoy being on the boat. There she blows! Can you see the mist? 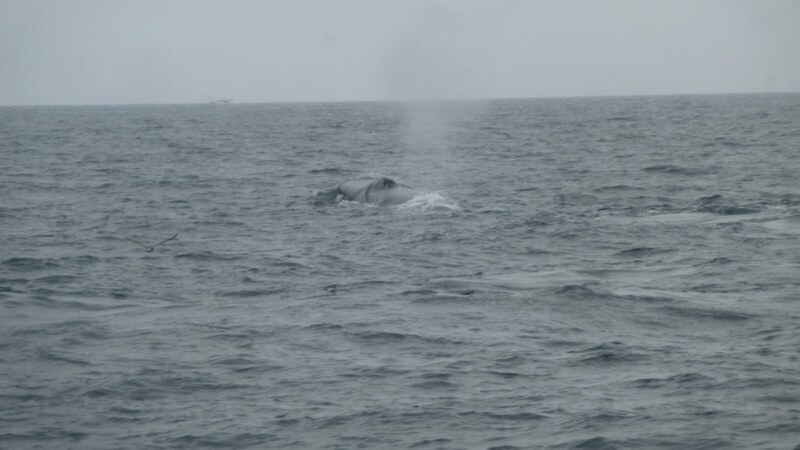 Thats the water and air coming out of this fin whale’s spout. 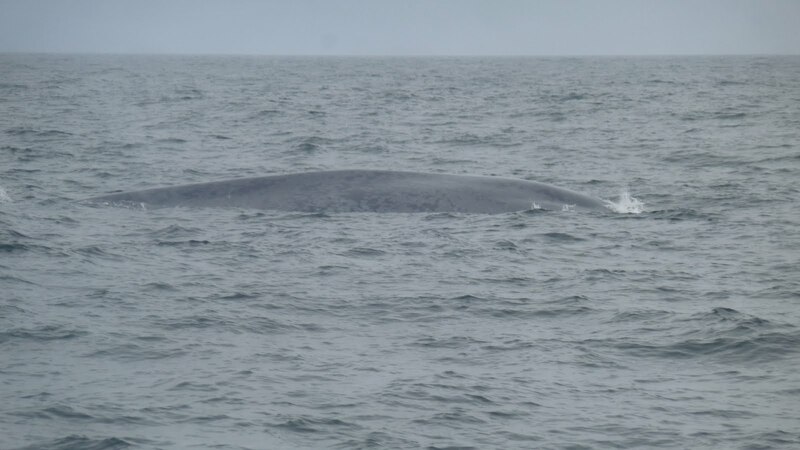 Fin whales are the second largest animals on the planet. They are very similar to blue whales, but they are darker in color and they have a larger dorsal fin… hence their name. This is what we came for, the majestic blue whale. I know it is hard without some frame of reference, but this one was HUGE!!! If I was swimming next to him in this picture, I’d maybe be 2-3 inches long? It was incredible to be so close to these enchanting creatures. See his blow hole?? That’s one GIANT nose. We also saw a mama and baby swimming together, but didn’t get any pictures. They swam so close to each other, they looked like one animal moving gracefully through the water. Sadly, we didn’t get to see any tails. That is the iconic picture everyone hopes for, but the whales didn’t feel like diving far enough down to show us that day. Another thing we tried to capture on video, but failed, was a group (pod?) of dolphins swimming behind the boat. They were jumping and diving like crazy as we headed to another whale watching spot. I have had a very special pace in my heart for dolphins (and all animals, for that matter) ever since I saw the movie The Cove. Have you seen it? If not, you definitely should. Here is a video of two blue whales swimming together. You can’t really see their bodies, but you can see them breathing! Blue Whales! from Amy Carter on Vimeo. It was an experience I’ll never forget and I can’t wait to go again with our kids one day! ← Oh please pick us! How fun!! You guys are so cute. Carter would have loved that. Maybe next time..